Back in the "golden age" of high-end audio hardly a month went by that you couldn't find and read a negative review in The Absolute Sound or Stereophile which excoriated a particular manufacturer's newest offering. Nowadays it's hard to find an equipment review that doesn't describe its subject in glowing terms. What's changed? As someone who's experienced their fair share of good, bad, and occasionally great vintage audio components, I think that the reason is quite simple - currently available audio components offer a far fewer models that deliver a truly bad value. In the olden, golden times, that was not the case. Also old-school audiophiles had a much higher tolerance for less-than-stellar reliability. Need I mention Audio Research's series of preamplifiers that needed to be "revised" from A to B to C versions before they worked reliably? But you would not know this from reading a recent article in Gizmodo by Adrian Covert titled "Why Your Dad's 30-year-old Stereo is Better Than Your New One" the author puts forward the idea that new receivers are inferior to 30-year-old ones. But during the article the writer hedges his bets by comparing a current-production $500 receiver with a 1980 $500 receiver. If he wanted to compare apples to apples instead of apples to pureed applesauce he should have compared a 30-year-old $500 receiver with a $1400 receiver since that is what $500 in 1980 would be priced at in today's dollars. When you compare a typical $500 1980 receiver with a current offering you'll see that there's lots of sonic reasons to consider buying new. 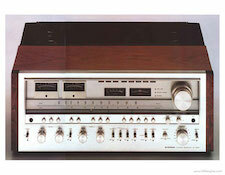 Take the $1399 MSRP Marantz SR6010, which is Marantz's second to the top-of-the-line model. Besides offering far more input options, including Bluetooth, WiFi, DLNA, and Airplay compatibility, this receiver has a Marantz's HDAM audio output circuit topology, which is not merely an Op amp integrated circuit. The SR6010 also includes Audessey processing to help correct for room-based sonic anomalies. There's nothing even remotely like this available in a 30-year-old receiver. And, if used properly, Audessey can vastly improve the sound in a multi-use environment in ways that can't be achieved by a 30-year-old receiver regardless of its make, price, or purported sonic excellence. There is one particular area where a 30-year-old receiver will beat ANY new receiver - it will discounted far more than a new one. And it should be. Chances are you'll find plenty of $300 to $500 30-year-old receivers at your local Good Will or Salvation Army resale store. Every time I dropped into one of the large stores in Denver I've seen multiple receivers available - all for less than $100. But remember that most 30-year-old electronics does need some refurbishing for reliability and best sound to insure that the capacitors aren't leaky and none of the resistors in critical locations are going bad. So you need to factor in repair or refurbishment costs with any older piece of HiFi gear you purchase if your goal is a reliable and optimal sounding piece of gear. Your initial $100 spent can easily balloon into $200, $300, or even $500 in repair and refurb costs. So, unless you find a receiver that a repairman has for sale (that they have already had potentially failing parts replaced) you really have no idea how much that under $100 receiver will really cost you - you could very well wind up with the option of either a $100 boat anchor or $600 in sunk costs for a piece of gear that you've never even heard yet.